NEW ORLEANS – We are just a few days away from the awarding of The Bowerman, marking a thrilling finish to the 2010 track & field season. Bestowed to the nation’s top collegiate men’s and women’s track and field athlete, The Bowerman will be presented next Wednesday, December 15, in a ceremony that takes place in conjunction with the annual convention of the U.S. Track & Field and Cross Country Coaches Association (USTFCCCA) being held in San Antonio. Three of the six finalists were Olympians in the 2008 Beijing Games and all six will be on many short lists to participate in the 2012 London Games. The three finalists vying for this year’s men’s award include Ashton Eaton (Oregon), Andrew Wheating (Oregon), and Ryan Whiting (Arizona State). Eaton bested a 17-year-old world record in the heptathlon during the 2010 indoor season and won NCAA titles in both seasons with the combined events. Wheating won NCAA outdoor crowns in the 800 and 1500 meters, becoming the first to accomplish the epic double win since 1984. Whiting once again won NCAA shot put crowns during both indoor and outdoor seasons and added his first national title with the discus. Last year, Galen Rupp of Oregon won the inaugural men’s award. The women’s award will be presented to Queen Harrison (Virginia Tech), Lisa Koll (Iowa State), or Blessing Okagbare (UTEP). Harrison became the first female in NCAA Division I history to win national titles in the 100 hurdles and 400 hurdles in the same championships. Koll set a new collegiate record in the 10,000 meters during the outdoor season and swept NCAA crowns in the 5,000 and 10,000 meters at the NCAA Outdoor Championships, becoming only the fourth female in history to do so. Okagbare notched NCAA titles in the 100 meters and long jump outdoors, becoming the first female in Division I history to do. In 2009, Jenny Barringer of Colorado was the winner of the inaugural women’s award. John Anderson, anchor of ESPN’s SportsCenter and co-host of ABC’s Wipeout will serve as the evening’s master of ceremonies. Anderson was a former student-athlete and high jumper at the University of Missouri. The awards ceremony will take begin next Wednesday at 7 p.m., central, at the JW Marriott Hill Country in San Antonio, Texas, and a broadcast of the proceedings will be streamed live on Flotrack.org. The show will feature on-stage interviews with each of the finalists and will accompany an archival look back on their seasons. Paper balloting by The Bowerman Advisory Board, 2009 winners, and selected media personnel, statisticians, and collegiate administrators, selected each of the winners. An independent accounting firm collected, tabulated, and certified the final results and will keep the result secret until the envelope is opened in a few days. In addition, online fan balloting comprised one vote in the overall totals. Over 27,000 votes were cast this year and Lisa Koll (53 percent) was the women’s top vote getter while Queen Harrison (43 percent) and Blessing Okagbare (4 percent) followed. The men’s voting was incredibly tight as Ryan Whiting (39 percent) earned the fan vote nod, followed by Ashton Eaton (35 percent) and Andrew Wheating (26 percent). The Bowerman is named in honor of track and field pioneer Bill Bowerman, who served the sport of track and field in numerous ways, including his leadership in the USTFCCCA predecessor organization the National Collegiate Track Coaches Association, and his contributions to NCAA track and field and the running community as a whole. 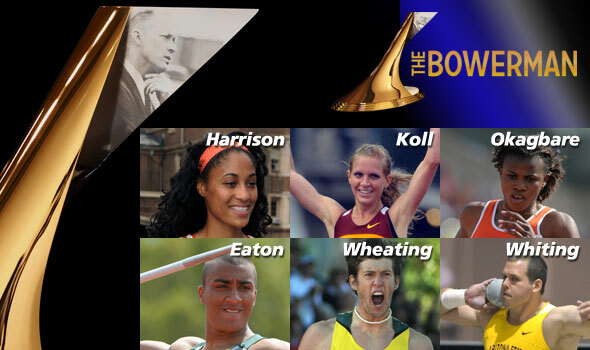 The Bowerman, administered by the USTTFCCCA, was first presented in 2009. For more information on The Bowerman, the award, the recently-debuted trophy, and Bill Bowerman himself, visit TheBowerman.org. The U.S. Track & Field and Cross Country Coaches Association (USTFCCCA) is a non-profit professional organization representing cross country and track & field coaches of all levels. The organization represents over 8,000 coaching members encompassing 94 percent of all NCAA track & field programs (DI, DII, and DIII) and includes members representing the NAIA as well as a number of state high school coaches associations. Harrision, a native of Richmond, Va., became the first female in NCAA history to win both 100- and 400-meter hurdle national titles. In addition, Harrison won the NCAA indoor crown in the 60-meter hurdles. Harrison recorded the 2010 collegiate-best times in all three hurdle events spanning the indoor and outdoor seasons and went undefeated in every final of those events. Harrison notched the fourth-best, all-time collegiate best 100-meter hurdle time in winning the Penn Relays title (12.61). Harrison was named the USTFCCCA Southeast Region Track Athlete of the Year for both the indoor and outdoor campaigns. Koll, a native of Fort Dodge, Iowa, swept NCAA crowns in the 5000 and 10,000 meters at the NCAA Outdoor Championships to become only the fourth female in history to do so. Koll won the 10k by over 23 seconds to claim her second-ever national title in the event while her 30-second victory in the national final of the 5000 meters paired with her 2010 NCAA indoor title at the same distance. Koll opened the outdoor season with a collegiate record, clocking 31:18.07 in the 10k at the Stanford Invitational. In individual races, Koll only lost to a collegian once during the season. Koll was selected by the nation’s coaches as the USTFCCCA National Track Athlete of the Year during the outdoor season and a regional-award winner in the same category for the indoor season. Okagbare, a native of Sapele, Nigeria, notched NCAA crowns during the outdoor season in the 100 meters and long jump, becoming the first female in collegiate history to pull off such a feat. In the indoor season, Okagbare won national titles in the 60 meters and long jump and grabbed top honors in the long jump in topping the NCAA Championships meet record twice. Okagbare was undefeated in all sprint and jump finals during the season and anchored the UTEP 4×100 to the NCAA Championships semifinal. Okagbare was the USTFCCCA Mountain Region Track Athlete and Mountain Region Field Athlete of the Year during the indoor season and the once again the Mountain Region Track Athlete of the Year for the outdoor season. Eaton, a native of Bend, Ore., netted a second-straight NCAA heptathlon title during the indoor season and a third-consecutive NCAA decathlon crown outdoors. Scoring 6,499 points at the NCAA Indoor Championships, Eaton topped the 17-year-old world record held by Dan O’Brien. Twice during the indoor season, Eaton bettered the heptathlon collegiate record. Outdoors, Eaton scored over 8150 points in each of his three decathlons, and beat the NCAA Championships meet record in the event. Eaton was the USTFCCCA National Field Athlete of the Year during the indoor season and shared the award with Ryan Whiting outdoors. Wheating, a native of Norwich, Vt., won NCAA outdoor crowns in the 800 and 1500 meters, becoming the fourth overall and first to accomplish the double win since 1984. Wheating also defended his outdoor 800-meter national crown with the win and was the first American to do so since 1994. In the 1500, Wheating led Oregon to a 1-2-3 national sweep of the event. At the NCAA Indoor Championships, Wheating anchored the DMR team to their second-straight national title and was the national runner-up in the 800 meters. Wheating was the outdoor USTFCCCA National Track Athlete of the Year and the West Region Track Athlete of the Year during the indoor season. Whiting, a native of Harrisburg, Pa., produced a third-straight NCAA indoor crown with the shot put and a second-consecutive outdoor title. In addition, Whiting won his first NCAA crown with the discus and is only one of 11 to have notched national crowns with the shot and discus in the same championship. At the outdoor championships, Whiting’s final toss of 72-1 (21.97m) moved him into a tie for second on the all-time collegiate list and just three centimeters shy of the collegiate record. Overall, Whiting marked throws of over 70 feet on eight occasions during the year – an all-time collegiate best. Whiting was also undefeated among collegians with the shot in 2010. Whiting was the outdoor USTFCCCA Co-National Field Athlete of the Year.